Last month, more than 10,000 negotiators from 189 countries attended the latest UN climate change conference, known as the 19th Conference of the Parties, or COP-19, this year held in Warsaw. To many, COP-19 fell frustratingly short of its already low expectations: there were no significant new agreements and 132 developing countries along with many major non-government groups staged a walkout in protest. However, it was notable for several signs of continued progress in bringing women’s voices to the negotiating table. Understanding the different effects of climate policies on women, especially in developing countries, is critical. As studies have shown, women are disproportionately adversely affected by climate change and natural disasters, yet are often excluded from important decisions at many levels. Typhoon Haiyan, which tragically struck the Philippines just two days before the conference started was a prescient reminder of the reality of these findings. More than 5,000 people were killed and 3.6 million displaced. The UN Population Fund estimated that those affected include more than 200,000 pregnant women, who now lack access to basic healthcare and antibiotics, nearly 900 of which give birth every day. UN Humanitarian Chief Valerie Amos also warned of increased sexual and gender-based violence in densely populated relief camps. The Philippines’ Chief Negotiator Yeb Saño’s impassioned call for urgent action on the opening day may have been most memorable and significant moment of COP-19. “Stop this madness,” he decried while breaking down in tears recounting the unprecedented devastation of Haiyan, and thousands around the world joined him in a 13-day hunger strike for a “meaningful and just” outcome at the conference. Though Saño and his supporters may have ultimately been disappointed with the result, COP-19 did mark a few official firsts for the inclusion of gender in the formal negotiation process. This year, during the first week of the conference, more than 200 delegates, myself included, attended the inaugural UNFCCC gender workshop, mandated by last year’s COP and co-hosted by Norway and Paraguay. The event showcased efforts to strengthen women’s leadership and participation in the decision-making process and advance gender-sensitive climate policy. Warsaw was also the first conference in UNFCCC history where “gender and climate change” was designated as a standing item on the agenda. On this year’s “Gender Day” (first introduced last year), the International Union for the Conservation of Nature also released the first-ever Environment and Gender Index. The report’s purpose is to fill this gap, to “measure progress, improve information, and empower countries to take steps forward for gender equality and for the environment.” The Index measures and ranks 72 countries’ in six environment and gender categories, including ecosystem health; overall livelihood conditions; good governance indicators, such as political stability; gender-based rights and political participation; gender-based access to education, property rights, and markets; and the self-reported inclusion of gender-sensitive policies in the UNFCCC and other international agreements. The Index ranks Iceland as the highest performer in most of the six categories, though they have had a low percentage of women negotiators present at COPs. Interestingly, the United States has the same low score (24 out of 100) when it comes to women in national policymaking positions as Bangladesh, one of the weakest overall performers. The Democratic Republic of the Congo scored the lowest overall. 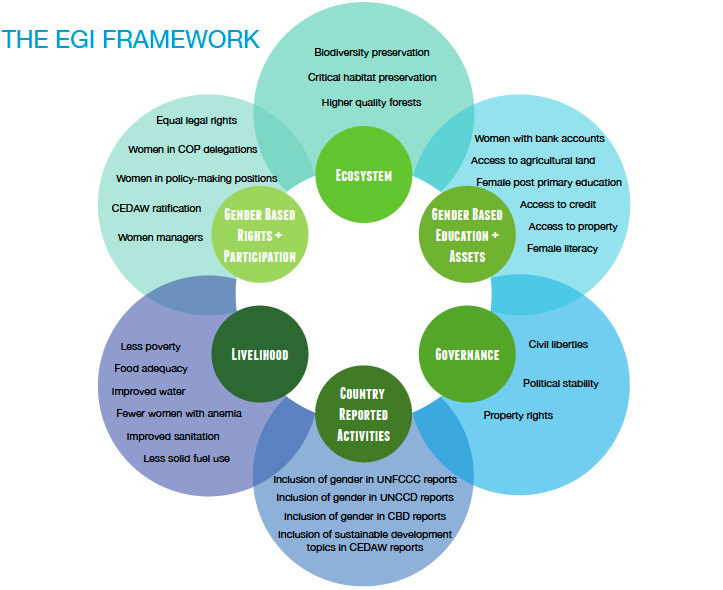 The report also finds that gender-disaggregated data from specific environmental sectors is limited or may not exist, and that accountability between international agreements and implementation on a national level is limited as well. In other words, despite much evidence that climate-gender dynamics should be of concern to policymakers, most know very little about how women are actually being affected in their countries. The lack of integration between international agreements and national implementation plans is especially troubling as countries attempt to quickly adapt to changing climate patterns. Looking forward, it is imperative that gender does not remain an isolated agenda item but continues to be better integrated into the COP negotiations – in discussions on adaptation, mitigation, and loss and damage. While there were signs of headway this year, as Dessima Williams, the UN Ambassador from Grenada, said at the gender workshop, “tremendous progress” still needs to be made. Over and over, I saw negotiators table dialogue on gender and postpone adopting any resolution until a future COP. And women continue to be severely underrepresented in the decision-making process. Since COP-14 (2008), women have only represented an average of 30 percent of delegation parties and a mere 19 percent of party heads. Awareness of gender dynamics may be moving into the mainstream, but it is still not an issue of urgency for many decision-makers (though, to be fair, lack of urgency has been leveled as a criticism of the entire COP process, as Saño would surely agree). What’s needed at future COPs is agreement on forceful and concise language in the formal text that underscores the importance of integrating the unique vulnerability and strengths of women in all climate change responses. Maria Prebble is a master’s candidate in environmental economics and policy at the Duke University Nicholas School of the Environment. She attended COP-19 as part of the Palau delegation. Sources: ABS-CBN News, International Union for the Conservation of Nature, UN Framework Convention on Climate Change, UN Population Fund, Women’s Environment and Development Organization. 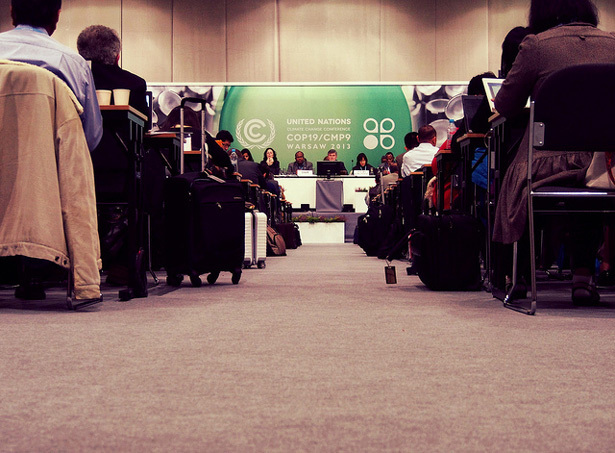 Photo Credit: The COP-19 presidency consults with the Group of 77 and China, courtesy of flickr user Shubert Ciencia.